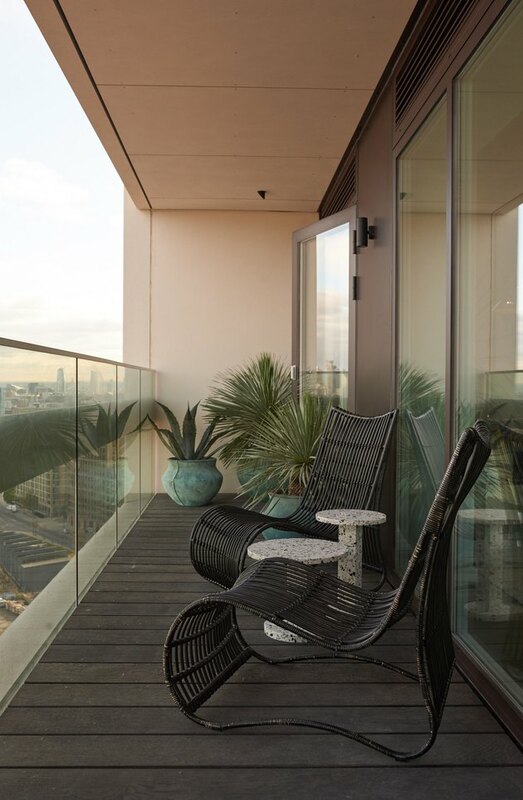 An apartment located on the 16th floor of a new building in Camden — the London neighborhood famous for incubating the punk rock scene — presented new challenges for design firm No.12 Studio. The 800-square-foot space had a restricting layout, and the team wanted to give each area its own vibe. To do this, they took a "sun survey," which determines natural light patterns throughout a home. 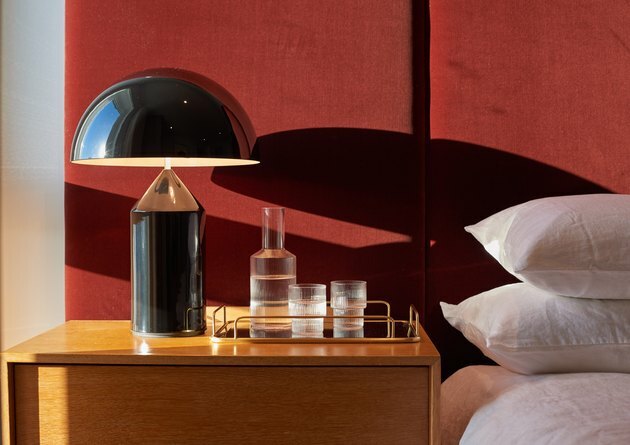 "The master [bedroom] is on the west side of the property so it receives the lovely afternoon sun," explained Emma Rayner, the company's co-founder and creative director. "This is where we created more of a dramatic look," Rayner said. A neutral framework serves to highlight the intentionality of color choice and furniture placement, resulting in a home that makes the most of small-space living. 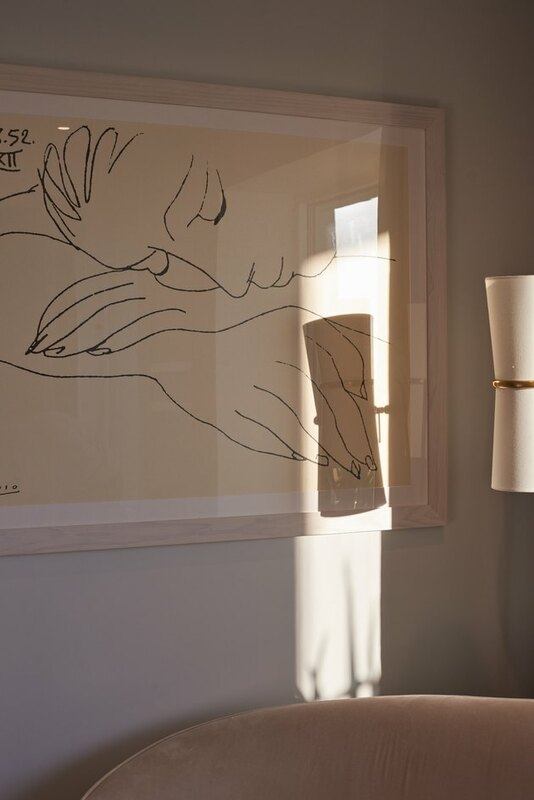 In the living room, a large Picasso print hangs in a solid oak frame. Corner windows in the living room and dining areas allowed the team to create a design around shadows and light. "We worked with the space and denoted the reception area with a long light-colored rug to create a sense of lightness," Rayner said. The pouf was custom-designed by No.12 Studio. The main living spaces — made up of the living room, dining, and kitchen areas — are situated within a narrow open-floor plan. Through careful placement of furniture and color choice, the team was successful in differentiating areas while retaining a sense of openness throughout. 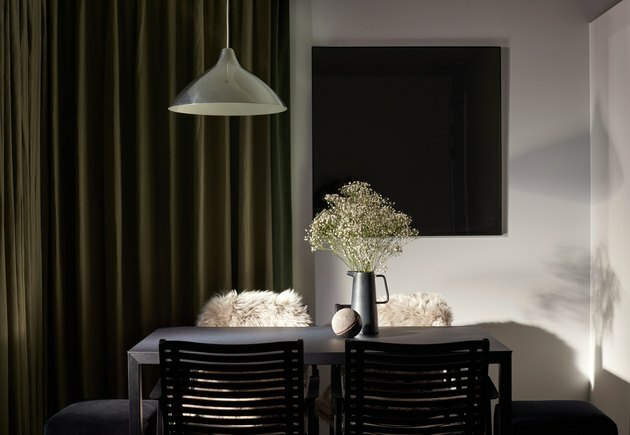 "The desaturated green curtains of the reception area wrap the whole length of the wall to the far end of the dining area and return around the corner," said Rayner. "This unified each area and has added a lovely soft touch of color to what is a purposefully very simplified palette." Vintage side tables are one of the only exposed wood furnishings in the whole apartment, which is loaded with ceramics, heavy fabrics, and marble. While the rest of the apartment has a light and airy feel, the team took a more toned-down and relaxing approach to the private bedrooms. Natural light isn't the only way that the team experimented with lighting design throughout the apartment. Stylish lamps, many vintage, brighten each room. 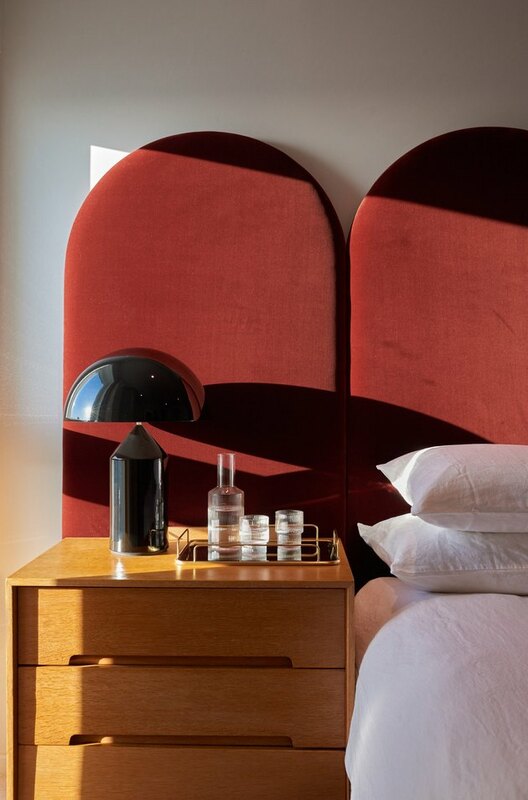 A bespoke headboard and bed design by No.12 Studio gives a textured and colorful backdrop to the sleeping area. 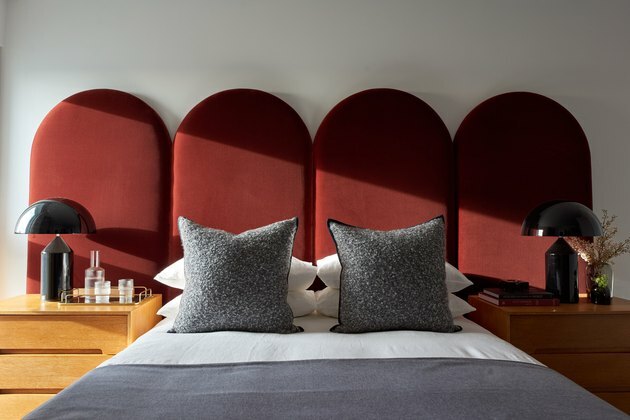 Accent pillows were created by De La Couna, a store committed to bespoke design. 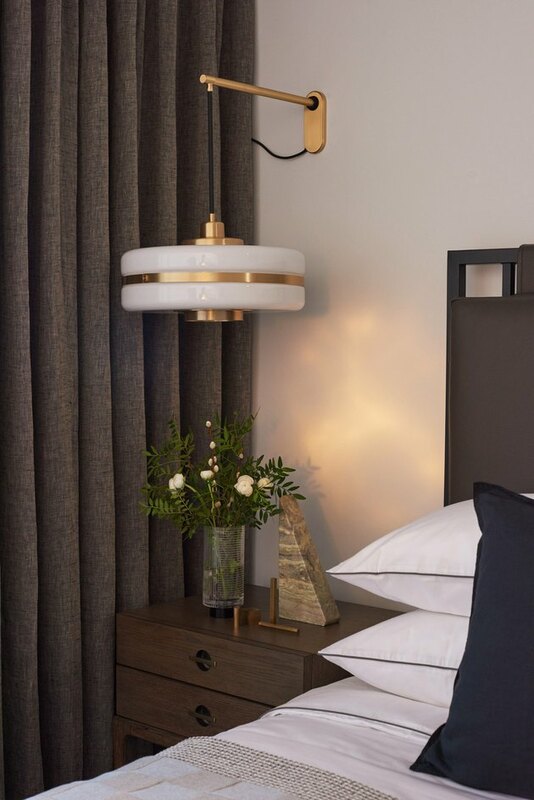 A glamorous Masina wall lamp from Bert Frank in the second bedroom functions as the ideal nighttime reading light. The balcony provides awesome views of Camden's canal and all the neighborhood's fantastic architecture. 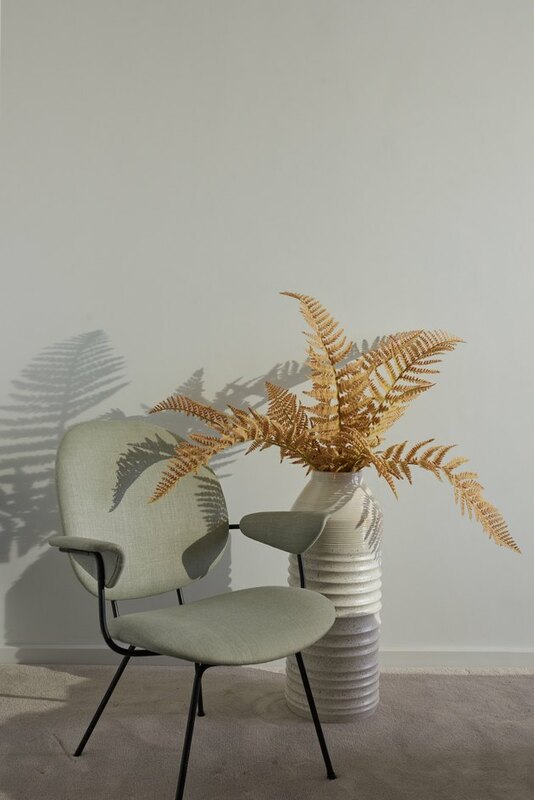 Black rattan lounge chairs from Rocket St. George are paired with Primo side tables from Another Brand and planters from Urban Flower Company.